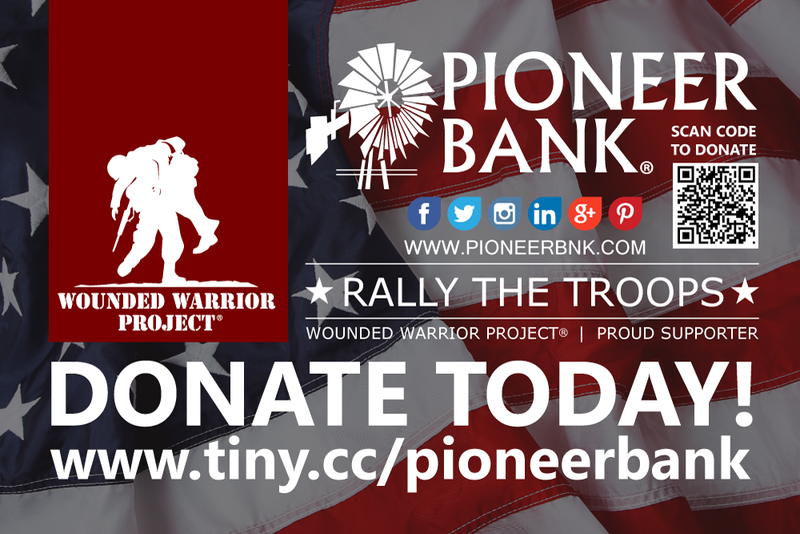 Pioneer Bank at 7015 N. Mesa in El Paso is proud to support the Wounded Warrior Project! As many of you know, We are passionate about giving back to our nation’s service members – the few who fight to protect the freedom of this great country. Often times many of these inspiring individuals come home with wounds you can and can’t see, like a missing limb, combat stress, or depression. Because they’ve risked everything for us, We are committed to raising awareness and funds for these wounded service members and their caregivers. We, at Pioneer Bank, are proud to host an event benefiting an organization whose mission is to honor and empower Wounded Warriors. Wounded Warrior Project® (WWP) has a big, audacious goal: to foster the most successful, well-adjusted generation of wounded service members in our nation’s history. We are challenging ourselves to help WWP reach this vision, and we need your help. Please join our effort and give what you can by donating through our page. Click on the link below and Thank you in advance for your support! Tags: donate, rally, support, TROOPS, wounded warrior. Bookmark the permalink.